I MADE THESE TODAY- Red Velvet Cupcakes with Cream Cheese frosting! 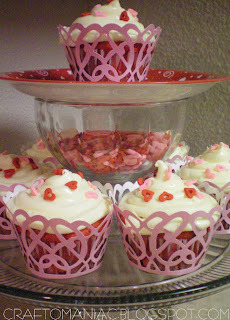 I HEART Pretty TASTY treats, and Valentine Sweets! The Fancy pink scrolly cupcake wraps I got at Walmart. I got my recipe from NONE other then- Adorable reminds me of my own mother, love her show and her personality- Mrs. Paula Dean herself- well foodnetwork.com. 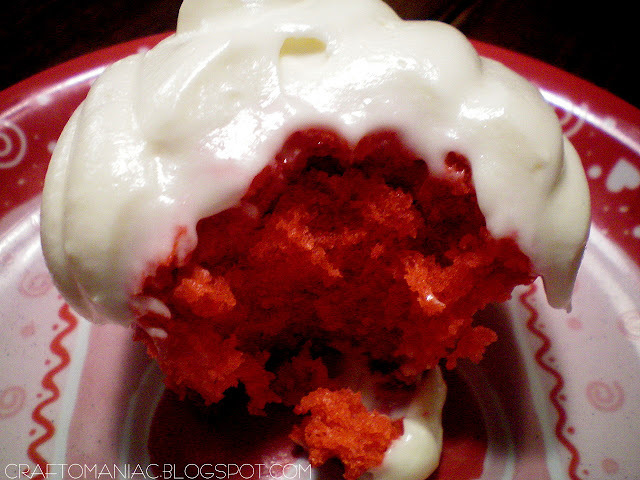 ENJOY, its all from scratch and nothing is better then homemade CREAM CHEESE FROSTING! THE BABY AND I ARE SUPER HAPPY! WINKS! I am linking with Deck the Halls of Home with Joy for Friday Fun HERE and The Girl Creative for Just Something I whipped UP HERE. and Paisley Passions for Fun with Food Friday HERE. They look SO tasty! I <3 Paula Dean!!! I can smell them baking. There are few things better than homemade red velvet! 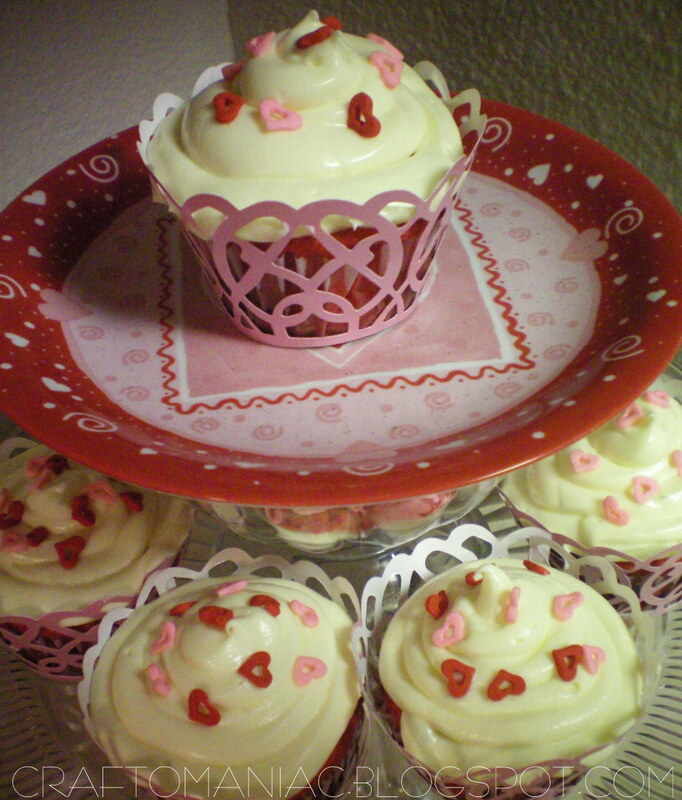 And I LOVE homemade cream cheese frosting! They look festive and adorable. One of the perks to living in the south is year round Red Velvet Cake available at every store!! I can see that these cakes are delicious. This are good for the coming valentines day. I hope i had a talent like that. Now I’m Hungary.. Thanks alot 😉 They are gorgeous! 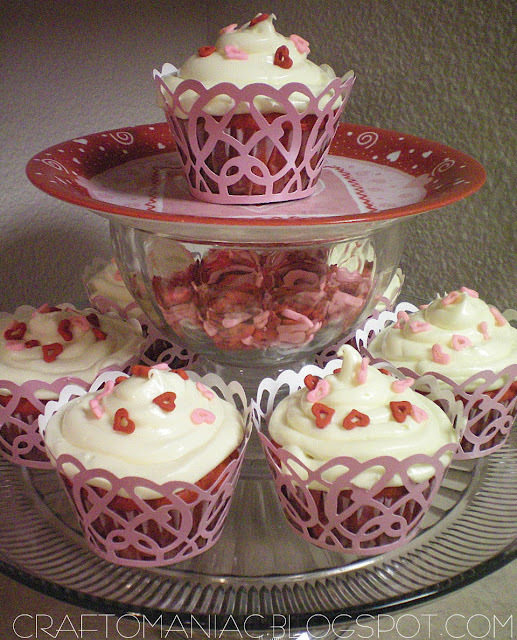 I’ve been craving cupcakes all day today, those look great! I wish we were neighbors! Come join my first “Friday Weekend Fun” linky party! I can’t believe you got the cupcake wrappers at Walmart – they look like they were cut with a Silhouette. Have a great weekend Jennie! These look delicious and I like your unique cupcake stand. Fun! i am impressed with how prompt you are with your Holiday decor and fun posts! Love your site! These cupcakes are teasing my sweet tooth! Thanks now I want a goodie!! Yummy! These are very pretty! I love the color and the design. Really nice. My favorite flavor! I love the presentation and the darling scroll wraps. Great job!